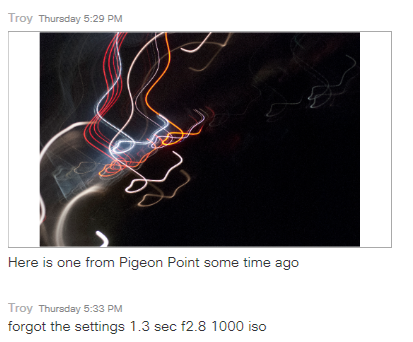 Two weeks ago in class we covered basics (what is a photograph, using manual settings) Last week we learned a bit about noise, and its primary causes – temperature being the principle problem. And we explored different creative directions under the umbrella of night photography. We also got outside under a half-full moon (first quarter) and shot on campus. And learned a little about the night sky. This view is southwest. From left to right are Canis Major, Orion and Taurus. The moon is off the top edge. The glow in the lower right corner is the glow bracelet on one of the student’s tripods. The sky remains blue due to the moonlight. 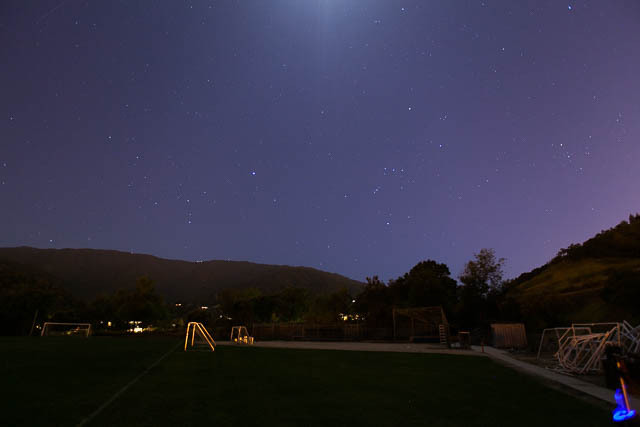 Settings for this shot are ISO 800, f/2.8, 10 seconds, 20 mm on Canon 5D II. Now it is time to talk about gear. Fortunately we already wrote a nicely detailed article about gear. Take a look here. We even updated it recently. Decent camera body with an optical viewfinder. Full frame preferred, but not necessary. Layered clothing and good shoes, including lightweight gloves (G) – and heavy gloves in cold season. Other needful things: clear shower cap (A), lens cloth, hand cloth. 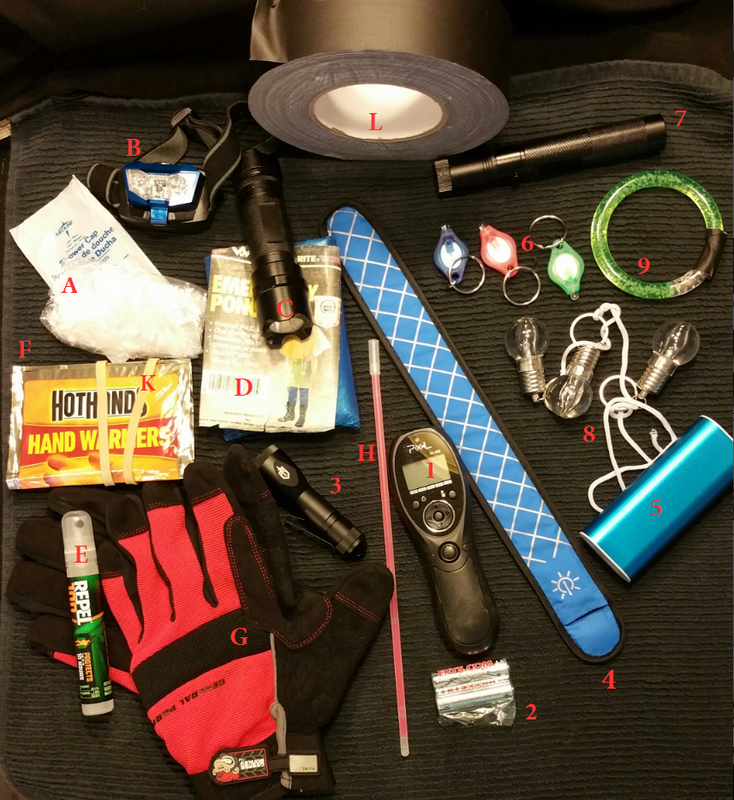 Here is what is usually in our bag besides the camera gear. (H) Glow bracelet/stick to mark the camera location (we have just started experimenting with other methods, too, like the LED band (4). Creative lights – bulbs, keychain lights, and cord (3, 4, 6, 7, 8, 9) Item 7 is a green laser pointer. Gaffers Tape – flat black duct tape (L). We don’t take a whole roll though! A smart app that shows the positions of the stars, planets, and bright satellites. Also helps if it shows meteor showers. A smart app that shows the location(s) of sunrise, sunset, moonrise and moonset. A game or two on the smart phone to pass time. An external battery to keep our smart phone juiced (5) and the appropriate matching cord. A star map (planisphere). On our desktop, we favor Stellarium, but it is a little geeky to use well. On iOS we like Sky Safari, Star Map. We asked you to pick a creative direction. 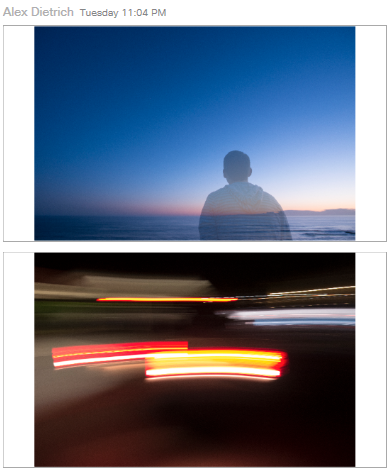 Here are some shots our students took including “semi transparent” you, moving lights. Use the light you were given in class to write a message or draw an image in light. The moon is full, if you didn’t work out settings for capturing the moon. Now is another chance. 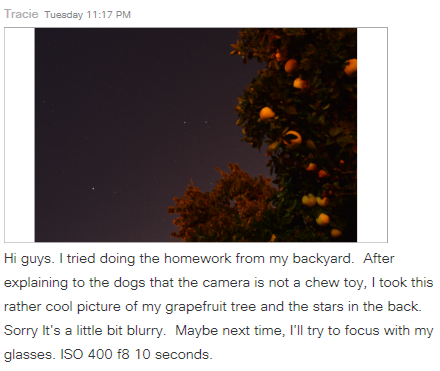 If you did work out the settings, compare them to your last shot when the moon was half-full. Notice anything? Find a way to make a strong white flashlight a different color. Use the colored light to illuminate your foreground. Your light may have to be really bright to compete with moonlight. If you are using a “white” LED flashlight, you’ll notice it is significantly cold (blue). Can you think of a way to make it a warmer color? Is there any “Other Gear” listed above that intrigues you? E.g. what can you use Gaffers Tape for? This entry was posted in Class, Creativity, Gear, Intervalometer, Light Painting, Tools, Tripod and tagged equipment, gear, headlamp, intervalometer, lights, tips, tools on April 20, 2016 by Steven Christenson.